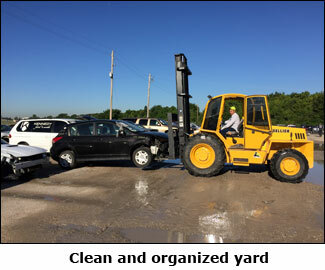 We are self-service auto recycling facility where you pull your own part. We offer a friendly and organized facility for your auto parts needs. Environmentally concerned - all of our cars are de-polluted and put on stands for your convenience. Most of our inventory is 2000 and newer and we have 3000 vehicles in stock. We are Tulsa's finest U Pull - come by and see for yourself today! Want cash for your junk car? Danny’s U Pull will buy junk cars in the Tulsa, Jenks, Sand Springs, Turley, Catoosa, and Broken Arrow area. We buy junk cars of any type- cars and trucks included. Give us info on your junk car and get a quick bid today. Please let us know if you are bringing parts in. We check all tool boxes entering and exiting. © DANNYS U-Pull. All Rights Reserved.